All work and no play makes Jonah a dull boy. But two years after the scheduled publication of Jonah Goldberg's magnum opus Liberal Fascism , there is no evidence that he has actually written anything other than the subtitle -- again and again and again, like Jack Nicholson in The Shining. And now he is even rewriting that. The original subtitle, "The Totalitarian Temptation from Mussolini to Hillary Clinton," had to be changed, probably because the publisher worried that Hillary Clinton would no longer be President by the time the book came out. 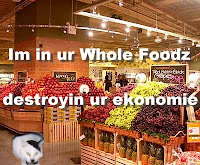 But the new subtitle, "The Totalitarian Temptation from Hegel to Whole Foods," has come under some criticism from jealous wags. "I’ve met John Mackey a number of times and I know for a fact that he’s not a 'fascist,' nor does he distribute 'fascist food,'" wrote Tom Palmer about the founder of Whole Foods. "Fascism is a more complicated subject than he makes it sound," Goldberg responded wearily, clearly worn out by all the energy he has expended rewriting the subtitle. "'I know John Mackey, John Mackey is a friend of mine, and he's no fascist,' is a pretty vapid argument." But in defending the subtle new subtitle, Goldberg has dropped a few tantalizing hints as to what the book is going to be about once he starts writing it. Apparently, Goldberg unearths for the first time shocking similarities between Nazis and liberals. For example, Nazis wanted to clean up the environment. So do liberals! Nazis wanted to cure cancer. So do liberals! Nazis liked organic food and many were vegetarians. So are many liberals! A lot of Nazis were gay and a lot of liberals are, too! Nazis made Volkswagons and liberals love to drive them! Hitler loved dogs and so do many liberals! (which is why many conservatives like Kathryn Jean Lopez were very relieved to discover that Mitt Romney hates dogs). Goldberg's book will explore the remarkably nuanced similarities between liberals and Nazis and not be the simplistic exercise in liberal bashing his critics claim it will be without even reading the book, which isn't even written yet. Like many conservatives I can't wait for Goldberg to publish his book, which he promises will be "a very serious, thoughtful, argument that has never been made in such detail or with such care." But the publication date keeps getting pushed farther and farther into the future. 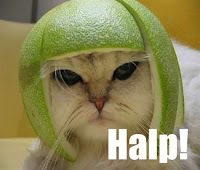 The first sign of trouble was when Goldberg asked for help from readers of The Corner. "I'm working on a chapter of the book which requires me to read a lot about and by Herbert Spencer," Goldberg said. "There's simply no way I can read all of it, nor do I really need to. But if there are any real experts on Spencer out there -- regardless of ideological affiliation -- I'd love to ask you a few questions in case I'm missing something." The idea that he would try to read any Spencer at all before writing about him already struck me as biting off more than he could chew. But the addition of Hegel to the new subtitle raises more troubling questions. Hegel is even more tedious and difficult to understand than Spencer and I'm afraid that finding someone who can explain Hegel to Goldberg is going to take up yet more precious time. After all, Hegel himself reportedly said, "Only one man ever understood me, and even he didn't understand me." I don't know how Goldberg can possibly meet his deadline in time for the book to come out on the latest publication date -- December 26 of this year -- so I have an idea that will save Goldberg a lot of time writing and also spare the reader from having to plow through too much prose once it's finished. 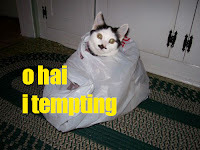 Most of Goldberg's ideas could be expressed much more economically, not to mention entertainingly, by using LOLcats, an Internet meme where pictures of cats and other cute animals (or "varmints," as Mitt Romney likes to call them) are captioned with grammatically challenged prose. 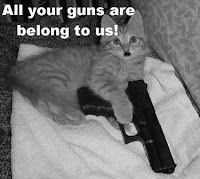 Cats are thematically appropriate because they are often used to depict Nazis in such books as Art Spiegelman's Maus and Maus II . 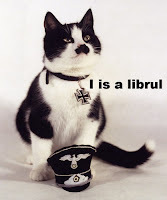 And conveniently, many cats look like Adolf Hitler so these "kitlers," as they are called, can be used as pictorial shorthand to depict liberals. 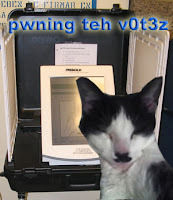 Using LOLcats to express his ideas instead of boring old-fashioned prose would also help Goldberg appeal to a new generation of young people who seem to be getting more and more liberal according to recent polls. In fact, I think Goldberg could solicit the help of many young Photoshop whizzes on the Internet to write the book for him. Below, I have already provided a few suggestions to start the ball rolling. Feel free to email me or drop links in the comments to your own examples and I will post the links here. Chapter 5: Why Do Liberals Hate Adam Smith? Chapter 13: Nazis and Liberals: Separated at Birth? Chapter 33: They're Taking Our Guns Away! Prologue: Liberal fascism is tempting! What a good idea! I'm sure even our Jonah could get his mind around some amusingly captioned cute photos. It does pain me to inform you that the hand is not invisible in your Adam Smith example. And that you once again failed to honor our esteemed ex-Governor by using his full name, Willard Mitt Romney. It's all right. I am the tolerant sort as I am not a liberal. Keep up the good work and pip pip! This has got to be one of the silliest websites I've ever seen. Don't you lieberals have jobs? My job is searching for non-sequiturs on the internets. Essentially what you'd have is a bunch of cats ghostLOLcatsing a coffee table book for Goldberg (who couldn't LOLcat if his life depended on it). I bet Bill Frist wold find a use for this book! I, too, am muy jealous of Jonah. What a country, where you can get paid to say what you think even though you don't have a clue. I'm moving there immediately. I almost thought about writing a book once. Where's my money? The title is forthcoming. Not sure, but I think -- given the topic of Jonah's book -- that he actually is blegging for help on Herbert Spencer (the political theorist), and not Edmund Spenser (the poet). So your "correction" might have been superfluous. However, the rest of the column is dead on. Jonah displays a type of idiocy that has never been done with such care. You have to be better connected or the offspring of the Bride of Satan to get a book contract just like that. Everyone knows that all the great authors in history thought up a provacative title and jacket cover illustration first, then developed their thesis afterwards. All great authors also ask their readers to do their research for them, because actually bothering to learn stuff is teh tedious. Who needs to learn 'facts' when you've already made up your mind? We must assume then that you have similar distaste for conservatives being called fascists for oversimplified reasons? I don't note that sentiment in your archives, though I may have missed it. The conservative complaint about that insult has the added advantage of being based on direct quotes from a wide variety of books already written. Satire of necessity exaggerates a point to illustrate its foolishness, but that is also its weakness - if you have to exaggerate something to make a criticism stick, perhaps it is not so contemptible as you suppose. Congratulations Jon! The original Swift told us that the sign of a true genius is that the assistant village idiots form a confederacy against him. Made me laugh! Bonus points for citing Maus! 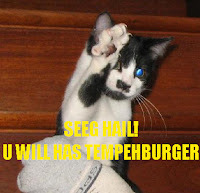 Although the Hitler cat may be the funniest. 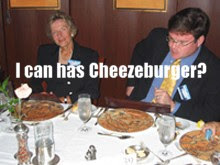 The sad thing is, the lolcats outclass and out-think Jonah Goldberg in every possible way! OK, so he writes a book. But will it have footnotes? Or endnotes? 'Cause that's how you know a book is serious, like, say, Ann Coulter's. Plus she showed us that accuracy or relevance aren't required, only the presence of copious, real-looking citations. Only nerds check footnotes anyways. This is really funny. The Nazi-liberal analogies just show how pathetic this line of argument is getting. "The Nazis breathed oxygen, [group under discussion] breathes oxygen, therefore [group under discussion] is like the Nazis." Unless someone can show that the group he's talking about has traits like genocidal anti-Semitism and an agenda of world conquest, the comparison is an insult to the reader's intelligence. 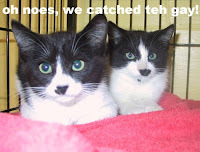 I laughed for two full minutes at the Dialektical Kittehs. Brilliant. Now I'd rather read the LOLcat version than Goldberg's magnum opus, even if I am morbidly curious about how Mr. Social Darwinism, Spencer, fits into a discussion of liberal totalitarianism. 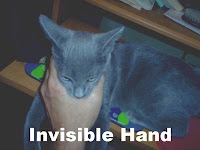 The Invisible hand is hilarious!! Ha Ha ha!! He should consult his fellow conservative intellectual and name-sake, Bernard Goldberg for catchy smarty-pants words and phrases, and maybe a few stories about how children are indoctrinated by facists/liberals in schools. That guy write books like crazy, and could perhaps give some pointers as to how to get a first sence started? Jon, you've captured the essence of Jonah, the Edgar Guest of American conservatism (i.e., the extreme opposite of fascism). Jonah's brilliance is exceeded only by your sober conservatism. Wow. This is truly a blog post for the ages! Very nice satire. This Goldberg is an outrage against humanity. Being way left of center I especially appreciate a conservative with a sense of humor and propriety. Are you serious or just in an ego contest with Jonah? Honestly, its just more agitprop bound for the remainer tables. Or maybe I'm just saying this because I'm tired of paying to be in the choir Goldberg and all the other Conservative ideologues preach to, and being asked to pay $27.95 for the privilege. Jonah, I agree with you 100%, and when the big red sticker says $2 I may even buy it (6 months now and its getting close). And Jon, I agree with you, too, even if you are a wishy-washy moderate who'll probably vote for Mitt Romney because his true persona is just as confused as yours. So shaddup both of you and lay off shooting the fish in that barrel. Your cats are cute, though. Spot-on, brilliant, piercing (for certain nepotist land-bound cetaceans) and even very funny. We have linked you on the front page and and blogrolled you under "Others" already. Thank you for your contribution to force that spoiled brat back where he dropped from, or at least to some tropical resort where he can be drunk without pretending to possess a high school education. To get your Google rankings for [Liberal Fascism with LOLcats] back, you could wait a month or so, since the algo filtering Google bombs doesn't run that frequently. "Jonah Goldberg's Shining (Liberal Fascism with LOLcats)"
and mentioning variations of the search terms [Liberal Fascism] near [LOLcats] in the first paragraphs could help too. 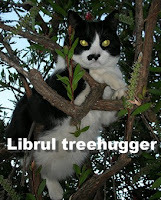 Since [LOLcats] is a popular term you can't rank for, make sure to use it very close to [Liberal Fascism] in your copy. Striking similarities? Don't some conservatives also want to cure cancer? It's so sad that idiots like you exist. You give us conservatives a bad name. Some of us use our brains! Go take a class in logic, PLEASE! Okay, the book's out now. Do you plan to read it, or do you stand by your review? Jonah who??? I don't care. This guy is one of the best comedians on the circuit. Kind of looks like an even chubbier version of Jim Gaffigan. Goldberg has been awfully busy keeping an eye on Hitlery and Hussein, so it seems a bit of a stretch to think that this patriot could find the time to finish his book (title.) Maybe a time will come when his services as a RNC repeater aren't so sorely needed, when I am sure he'll finish that title. You don't like to hear the truth. So you revert to fallacious attempts to break down his argument. You are the problem with this country. Jon-was thumbing through the old BBPCBTBT (in great anticipation of the this year's version) and lo and behold-I found that I didn't even comment on our very own host's offering! Sorry! Lol! and all that other stuff! Yes-btw -originally when this post came out, I had just began my blog, but you'd think I woulda been more thorough and saw the Jonah post! I promise to be more careful this time-I was a little blown away by the attention-I think also! Makes lots of sense. Jonah Goldberg's awful book needs to be criticised, but his rational arguments and gads of topical evidence makes this impossible. There really is a need in the Leftist community for a "straw man" copy of the book - one that has nothing at all to do with what Goldberg actually says, preferably with lots of pictures, but not nearly as literary and as footnoted as the original. Pretty snaps of kittens adorned with pithy slogans should work, I'd think. Goldberg was privy to the tapes and the conversations his mother had with Tripp because he served as a vice president of his mother's now-defunct literary agency. You are really a good webmaster. The web site loading pace is incredible. It kind of feels that you are doing any distinctive trick. Furthermore, The contents are masterwork. you’ve done a excellent task in this topic! Artikel yang bagus untuk di baca dan sangat membantu seo dan website nya foto nya bagus. Iklan Kami ......Garansi Uang Kembali Apabila pesanan tidak sampai. Mau Pesan Produk kami >> kLIK DI SINI.